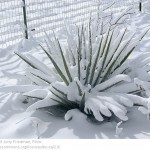 On my last post, I talked about how to add winter interest to your garden. Number 5 of my 7 pointers was to add plants with colorful winter berries. Today, I am going to talk about my favorite type of tree for winter berries, the four season interest crabapple. Not only do some crabapples have fabulous spring flowers, some also have other great four season interest attributes such as winter berry’s and even colorful fall colors. Crabapples also come in a variety of shapes and sizes so that they can fit into a variety of spots in the garden and fill many landscape roles. 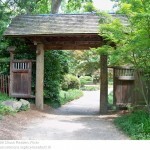 This includes shrubs, specimen trees, small shade trees, etc. In Japan the cherry tree blossoms are often revered for being a sign of spring. I am often questioned about where the cherries are at our garden and when they are blooming. For my money, however the cherry tree has NOTHING on the lowly crabapple in our Midwestern climate. Not only are more diseases resistant and hardier varieties of crabapples available, they can be pruned into MUCH nicer shapes. 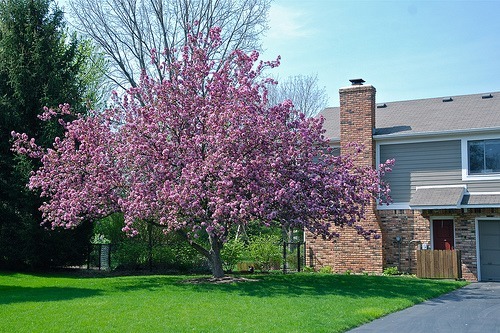 For the Midwest landscape, such as my native Chicago area, the majority of crabapples are vastly superior to the cherry trees as landscape plants. 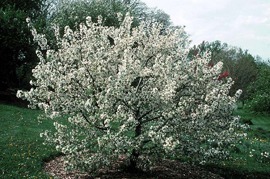 Malus ‘Bob White’ – A large (18-20 feet) rounded form of Crab with pink buds that turn white when fully open. Very fragrant flower for an Apple, which can be smelled far away from the tree. Fall color is golden yellow to warm orange. Smaller size fruit is yellow in fall and turns a deep gold in winter when they feed the birds. Fruit can last into late January. One negative is that it does alternate heavy and light flowers every other year. Holiday Gold crabapple (Malus ‘Hozam’)– is a large (18’ tall spreading to 14’ wide) open-rounded and yellow-fruited crabapple. It is noted for its white flowers, yellow fruit and good disease resistance. Pink buds open in spring to fragrant white flowers. 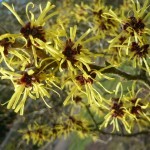 Flowers are followed by yellow fruit that hang in clusters along the branches. Fruit can supposedly last into March, but I would assume most years birds will take care of them earlier than that. 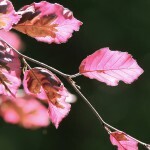 Strawberry Parfait Crabapple (Malus ‘Strawberry Parfait’) – Foliage emerges reddish-purple in the spring and matures to a deep green in the summer. Fall color is golden yellow. Red fruits persist into late winter. Its shape is irregular and spreading, reaching a height of about 20 feet and spread of 25 feet at maturity. This just so happens to be a tree I bought for my mother almost 10 years ago. I can say it has been the most disease resistant crabapple I have seen. It has gotten a little scab one year, but that was a horrible year for that disease and most years its foliage is almost perfectly clean. I have also seen fruit on this tree in February. I highly recommend it if its shape and flower color meets your needs. Sugar Tyme crabapple (Malus ‘Sugar Tyme’) – Fragrant pure snow white flower display from pale pink buds. Tree has a pretty deep red, persistent fruit through late winter. Good overall form with dense foliage. Grows 14-18′ tall and to 12-15′ wide. If you are a cheap like me, you will like that Home Depot carries this one in several sizes for cheap prices. Go look now and you might find one for 50-75% off. A four season interest Sugar Tyme crabapple is added. This has helped a lot. I have a crabapple tree that is very full and very beautiful but, the branches are so long that they droop down to the ground. I have no suckers growing and I pruned the bottom branches. Can you tell me if I can trim branches back without them growing back? I want to keep those branches I just don’t want them so long and heavy looking. You will probably have to do some maintenance pruning in upcoming years, but that’s OK and can even be fun. We recently built a new home on a few acres of land in Fort Wayne, IN. 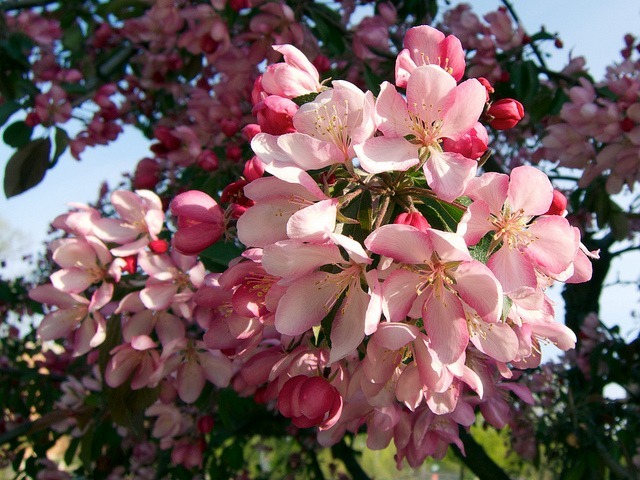 I love the flowers in the Spring on crabapple trees, and would love to plant a few. A friend mentioned that once the flowers fade and drop, the trees tend to look a little sparse and sickly in the summer. I have noticed that on the trees that I once loved in the spring. Is this a normal characteristic of crabapples? And if so, is there a variety that tends to be very full and green during the summer months? Thanks! Sure. Ones that look sparse are ones that get apple scab and other diseases. If you get a tree with Excellent disease resistance for Apple scab, firelight, cedar apple rust and powdery mildew like say the ‘Firebird’ crabapple I just planted in my yard, it should stay nice and full unless the weather is just perfect for disease that year. Don’t just trust the nurseries, look it up and find the most disease resistant trees that fit your needs.